The long-term perspective for the Aussie Market. 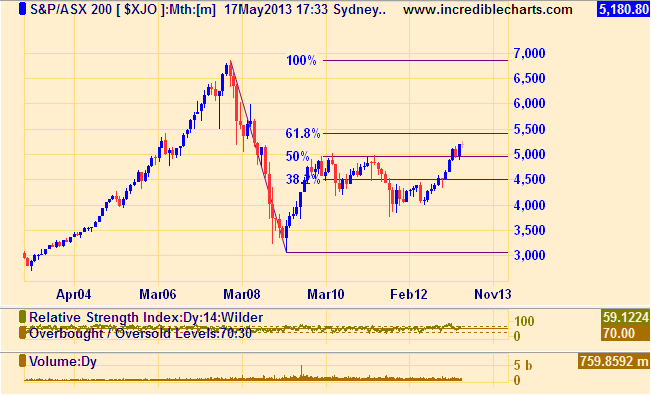 Now that the XJO has penetrated and found support at the half-way mark (5000), the next hurdle, assuming bullish conditions continue, is the 61.8% Fibonacci retracement level. This is at 5400. The last monthly candlestick at present has the appearance of a Doji, at 5200, indicating some lingering uncertainty about further gains. However as the month is not yet finished, this appearance could alter. Uptrend of the past year remains intact with a higher high. Overall the Australian market remains bullish with the XJO reaching a high of 5250 this week before pulling back to support at 5164. The recent retracement was at the bullish end of the usual range between one-third and two-thirds of the previous impulsive move higher; it was 33.74%, just short of the 38.2% fibonacci level. The candlestick for this past week of trading has the appearance of a “spinning top”; it too implies a degree of market ambivalence about the next market direction.. 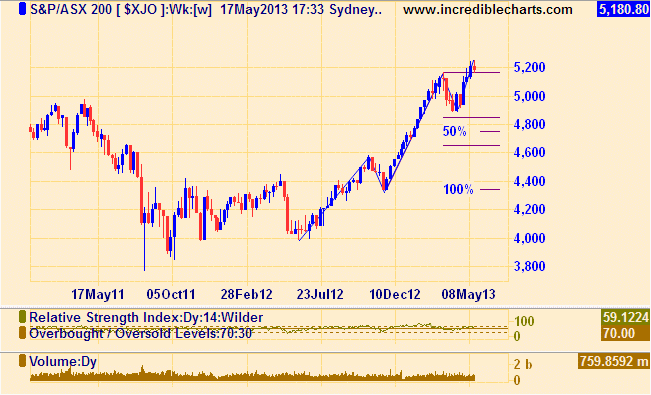 However the next target for the XJO is 5400. This is within reach in the next month if bullish sentiment continues. ‹ Chart Analysis – Ten Network Holdings.